Complications from diabetes can be devastating: limb amputations, loss of eyesight, kidney failure, heart problems. 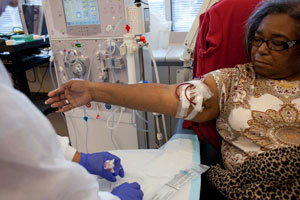 Just to stay alive, many Type 2 diabetics rely on dialysis. In 2008, over two-hundred thousand diabetics in the U.S. were on dialysis or had a kidney transplant because of kidney failure. "For our families and friends that have been on dialysis, they are true champions. They're true heroes," says Shalon Lang, whose 79-year old mother died early this year from end-stage renal failure due to diabetes. In October 2011, Lang commemorated her mother's life with dozens of other caregivers at a memorial service put on by DaVita dialysis center in South Sacramento. But the burden of diabetes is not evenly shared. While the overall rate of diabetes in the U.S. is just over eight percent, almost 13% of the African American population has been diagnosed. Black diabetics are twice as likely to die from the disease. 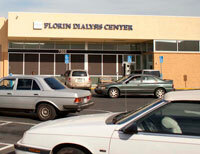 Many diabetics with failed kidneys spend half their days sitting in dialysis chairs. Their blood must be cleansed of toxins their kidneys can no longer remove. For most, it's an exhausting and burdensome process. But it prolongs life. Sixty-one year old Carolyn Jackson is one of 185 patients treated at the Florin Davita dialysis center in South Sacramento. She's diabetic. She's been going three times a week for years. She comes with blanket in hand to keep her warm through the long treatment. "I always have my bag and my phone to keep contact with the outside world for the four hours and 25 minutes that I'm in there," says Jackson. The scene outside the clinic is sobering. Patients filter in and out, using canes, wheelchairs, and arriving in subsidized transportation. Uncontrolled diabetes can lead to severe complications; gum disease, lower limb amputation, or blindness. Jackson looks young and healthy compared to many of the others at the dialysis center today. She walks in on her own two feet. "Some people [say], 'I hate going in.' I don't like it either, but if I want to live I have to go," explains Jackson. Diabetes is the main reason Jackson quit working in her early 50s. "So my job is to go for dialysis. I tell the kids, 'Oh, I'm getting ready to go to work. See you later when I get home.' That's the way I approach it." Lost productivity from diabetes in the U.S. amounted to more than $58 billion dollars in 2007, according to the American Diabetes Association. Even when Jackson was working and raising her kids, she said it was hard to afford healthy food on her income. "The foods that are good for you are too expensive. We cannot afford it. We cannot afford it. Fruits and vegetables are sky-high. I love my fruits and vegetables, but we barely get by ourselves, so someone else lower than we are, it's tough. It's tough, it's hard....We have no choice but to get the frozen foods, the frozen pizzas to try to feed the kids." U.S. census data show more than a quarter of African Americans live in poverty. Jackson says poor diet is a main cause for the high rates of diabetes in black communities. "We eat the sweets -- pound cake, the peach cobbler, things like that... Years ago, that's the way you showed a person how much you love them. By cooking for them." Jackson has worked to change her diet. Diabetes runs in her family, and she's trying to be a role model to the three adult children she lives with. One of her son's was diagnosed with diabetes, and another is borderline. On a Wednesday night after dialysis, she demonstrates cooking one of her "healthy" meals - chicken stir fry with vegetables. Members of the family take turns cooking. When it's Jackson's turn, she's mindful of her children's health. She walks around the kitchen tonight with a large white bandage on her upper forearm from the day's treatment. "I don't fry as much as I used to," explains Jackson. 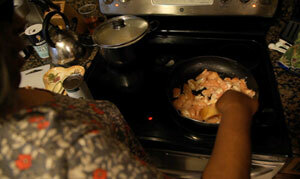 She remembers getting requests from one of her sons when she's deciding how to prepare a chicken dinner. "Oh mom, can you fry it?' Nope. 'Can you do it?' Nope. Nope. Can't do it. Either boil it, bake it, roast it, barbecue it, whatever. I'm not going to fry it." Jackson says what ends up on the table still depends on what's on sale at the store. But every meal does come with a vegetable. As she eats her dinner, Jackson worries about her 29 year-old son Andre. He was diagnosed with diabetes a few years ago. She says he has no health insurance, and is not taking care of himself the way he should. "He's still drinking his sweet drinks and Kool-Aid and not monitoring himself," says Carolyn. "I don't want him to turn out like I did, not knowing that I was a diabetic all those years and not taking care of myself properly. Then maybe I wouldn't have the damage in my eyes. I don't want him losing a limb." Jackson's days are limited by her diabetes. Her main activities are her church and dialysis. But she wants to spread awareness of the disease to the young people in her church, and beyond. "I might have a disease, but the disease does not have me. My grandkids, I want to be around for them. So I have to take care of myself. If not for me, for them, and my children." Brenda Darcel Lee is the Executive Director of the California Black Health Network. Formerly the Associate Director for Emergency Management and Planning at the California Primary Care Association, Darcel brings over 30 years of healthcare policy, legislative, and leadership experience to CBHN. Pamela Wu: We're doing a documentary about disparities in the diabetes epidemic, namely how ethnic communities suffer from higher rates than whites do. And African-Americans have some of the highest rates of diabetes. More than 12% have been diagnosed. Why are the rates as high as they are? Brenda Darcel Lee: Well I think what you said is the primary reason: disparities in the African-American community. Of course diet plays a major part, a major role, but the fact that many of our African-American families don't have primary-care physicians. Many of them use the ER for their health care. Prevention has not been practiced as readily in our communities as in some others, and I also think of disparities in terms of economic disparity. Lack of jobs means lack of access to healthy food, which means lack of access to health insurance, which means lack of access to a number of things, even activities that might render us more fit. So I think that disparities has a major, major role in the rise of diabetes.